- The patent-pending FIX Technology hook design provides a secure fit. Ergonomic Design for the ultimate fit means ear buds won’t fall out. FIX Technology is a new dawn of patent-pending ear bud design. Engineered for a FIXed in-ear fit. Revolutionary Engineering. Evolutionary Sound. Supreme Sound delivers Attacking Bass, Natural Vocals and Precision Highs. Mic3 delivers complete control of any IOS device. FIX Technology means ear buds won’t fall out. Ergonomic Design for the ultimate fit. 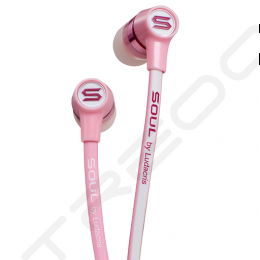 These earphones provide high-quality audio in a compact and lightweight design. The housings have a patent-pending hook design that provides a secure fit. There are also 2 different sizes of soft silicone gel eartips to provide additional stability and a high degree of passive noise isolation. They have 10mm neodymium drivers to deliver crisp, detailed audio with a wide frequency response. Rear acoustic ports help to extend low frequencies for added bass. The PAG cable has an inline Mic3 dongle, which offers a microphone and 3-button remote so you can make calls, take voice notes, control music playback, and adjust volume on devices such as the iPhone, iPod touch, and iPad. The gold-plated 3.5mm plug provides compatibility with a variety of MP3 players, CD players, laptops, and other devices. A carrying case is included for convenient storage and transportation.